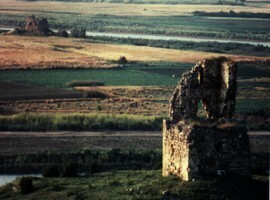 At a distance of about 100km from Thessaloniki, heading to Kavala and beyond the bridge of the Strymon River, between low hills, lie the ruins of ancient Amphipolis. 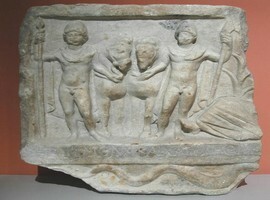 Amphipolis was situated at a height of 154 m on a natural-fortress hill near the mount Pangeo, 5 km from the sea on the eastern bank of the Strymon. 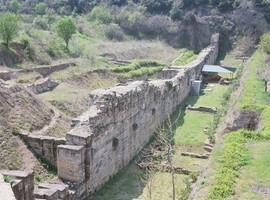 A twist of the Strymon River protects the western city walls. The all around view is breathtaking. In the background you can see the sea line of Thassos Island and the conical shape of Mount Athos. On the northern side you can see the plain of Serres with mountains in the distance. 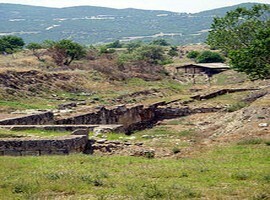 Agnon named the city Amphipolis, because it was embraced by the river Strymon from two sides. It was built in such a way that it is visible both from the sea and from land. 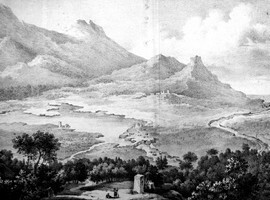 Because it was built at a strategic position on a cluster of hills, its citizens were able to oversee the mainland which was rich in both agricultural products and minerals. 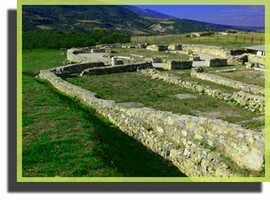 It was an operations center of the Thracians, Greeks, Macedonians, Romans, etc. 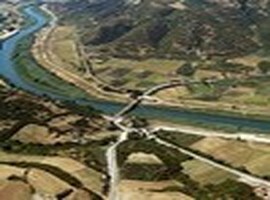 mainly because of the gold and silver in Mount Pangaio and because of its strategic position as well. 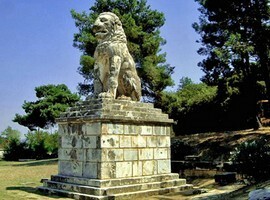 If you visit Amphipolis, the first sight contact is the statue of the Lion of Amphipolis just after the old bridge of the Strymon. The giant statue that was reconstructed with the pieces found on the Strymon River in 1936 and 1937. On the road from Serres coast to the city of Serres there is a sign that leads to a Macedonian grave. Two other graves are preserved on the hill right into the street. 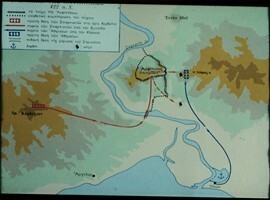 The first has been breached but the other contained wonderful inscriptions which now are in Museum of Kavala.Continuing the route, another sign to the left leads visitors through the ancient walls, and after a short distance one can see and the remaining ruins of the fortifications. Recent excavations have unearthed a great gym as well. 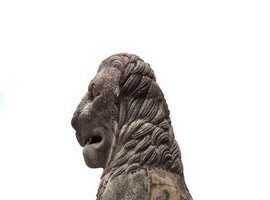 300 meters down the road there is a junction leading to the modern village of Amphipolis. 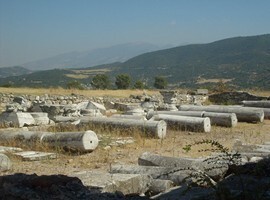 On the opposite hill there is a cemetery with stone graves, which was probably built during the Hellenistic era. In the modern village one can find a tribute to the Tattoo, a god of Thracian equivalent of Sleep. 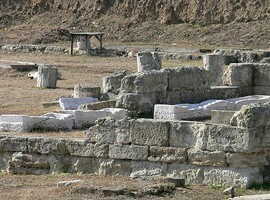 The signs then lead through the village to the main archaeological site, the citadel of the ancient city. The main findings that have so far during excavations date not in the classical period but they are five churches of the 5th and 6th century AD, four basilicas and one of a hexagonal internal configuration. 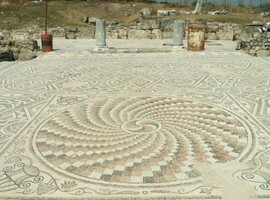 Visitors can admire some of the outstanding mosaics depicting various birds. 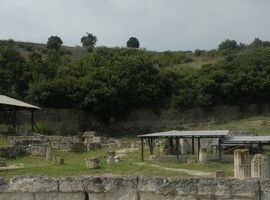 Some of the mosaic is protected by wooden sheds while others are semi-permanently covered. Just beyond, lay the ruins of a Roman house, covered up in order for its mosaics to be protected. It has, apart from the mosaics, a tiled courtyard with a well and a room with a roof arch, which at first was limed. Beside the house there is another house which has not yet been fully explored with statues at the entrance. The statues were probably offerings to the gods. 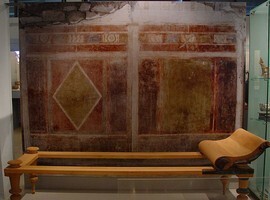 100 meters below these buildings stands a Hellenistic house covered with beautiful paintings. At the southeast, there is a reliquary right next to a deep ravine.